Most people measure 0 to 60 times, but I clock my times from Catonsville, Maryland to various interesting destinations. On this trip, I made the 220 miles to Haskell, New Jersey in just over 3 hours. Shortly thereafter, I was on foot and hopelessly lost in the woods, searching for what was left of the DuPont Powder Works on the Wanaque River. Okay, there were some reasons. As I later learned, a remarkable number of fires and explosions occurred here, especially the one in 1917 that involved 200 tons of high explosives. The force of the blast rocked four States and it is still considered the loudest man-made explosion ever. This was known as the Ballestite Bridge, named for the kind of powder in shotgun shells. It linked the DuPont facilities on the west and east sides of the Wanaque River. Did the missing section of the bridge land in one of those neighboring States?? After finding my way out of the Haskell woods, I continued north to Ringwood Manor. An ironworks had operated here starting in 1739 and was instrumental during the American Revolution and the War of 1812. The manor house was built in 1807 and expanded over the years to its present 78 rooms. Robert Erskine was a Scottish mathematician, inventor, and engineer. He was hired in 1771 to run the Ringwood ironworks, but he supported the Colonies when the Revolution broke out. The Ringwood grounds are “littered” with iron products created here, including the large gear on the left and—interestingly—a mammoth section of chain. Some say that this is a section of the famous “Hudson River Chain” used at West Point to prevent British warships from proceeding up the Hudson. (More likely it is a forgery from the late 1800s.) George Washington appointed Erskine as the Geographer and Surveyor General for the Continental Army, and he produced detailed maps that proved of great use to the war effort. This Civil War-era mortar is another lawn ornament at Ringwood. Mortar carriages were produced here for the Union Army throughout the war. I could have spent much more time at Ringwood Manor, but I had many miles to go and the 335i was waiting impatiently. You have to admit, these are truly handsome cars. The Sloat House and Tavern started life as a small home for Isaac Van Deursen in 1747. His daughter Marritje married Stephen Sloat, and the happy couple expanded the house substantially in 1755. During the American Revolution, George Washington stayed here at least once. Their grandson John became a Rear Admiral in the Navy and is credited with capturing California from Mexico. He served as the first governor of the new territory. The New York State Thruway (Route 17) through the Hudson River Valley, was originally a Lenni Lenape Indian trail for roughly 5,000 years. Those enterprising Dutchmen widened it, creating a usable road to Albany, which then became the Orange Turnpike and ultimately the Thruway. As I continued on, I suddenly realized that I was driving by the high school in Tuxedo, New York, where poor Lavender so enjoyed a dance—before returning to her grave of 10 years. (See Touring New York and New England, In Search of Lavender, Sam, and Alice.) Can it be that I’m running out of places to visit? The Clove Furnace remains in relatively good shape, especially given its size. At a height of 54 feet, it’s the largest iron furnace I’ve seen, and, surprisingly, it has passages that one can easily walk through. I don’t know if this is a record or not, but the furnace was in continuous blast for just over 10 years (1871-1881), producing 101,245 tons of pig iron in the process. Looking across the Ramapo River, I could just make out that a large house was lurking behind the thick foliage. I believe this was the ironmaster’s home. I would still have no idea what it looks like were it not for this Fall photo, courtesy of Peter A. Kopher and his excellent photo blog at peterkopher.blogspot.com. I left the Thruway a few miles farther on and headed east over the Bear Mountain Bridge. The peak on the opposite side of the Hudson River has been known as “Anthony’s Nose” since at least 1697. There are several candidates for whom the prominent hill was named, all of whom shared a resemblance to Cyrano de Bergerac. If you can imagine a scenic overlook at a place called Anthony’s Nose, then this is what the view would look like, with the Hudson below and the Bear Mountain Bridge in the distance. Looking across at the top of Bear Mountain, I wondered where Alina and Michele are these days—two interesting individuals I met on that mountaintop in 2013 (as reported in Almost Heaven: The Hudson River Valley). These buildings across the river on Ioana Island are all that’s left of the huge naval ammunition depot that was situated here from 1900 to 1947. Before the depot, there had been a hotel and amusement park here, serving visitors from New York City and New Jersey who arrived by steamship. Before the amusement park, produce was grown here for the Union Army during the Civil War, and before that, Native Americans lived on the island during the summer. Once again, every place has a long history. Meanwhile, back on Anthony’s Nose, I spotted this Triumph Bonneville. It was ridden by two young women who were returning from a camping trip, which explains how heavily laden it was. And no, I have no idea where they carried the big pillow while they were riding! Highway 202 was a fun little road as it twisted and turned along the base of Anthony’s Nose—although it also carries more traffic than you might expect for a back road. This tollhouse was used by the builders of the Bear Mountain Bridge and Highway 202 to collect tolls, starting in 1924. Both 202 and the magnificent Storm King Highway on the other side of the Hudson are now toll-free—but there’s still a toll for the bridge itself. This is New York, after all, where No Good Tax Goes Uncollected. In nearby Peekskill, I couldn’t resist a brief stop at the Villa Loretto Home for Wayward Girls, which was built and operated by the Sisters of the Good Shepherd. Author Stacy Horn described it as “where you went if you were young and in trouble, but not yet prison material.” Many of the young women who stayed at Villa Loretto credit the institution with saving their lives. The first building here, incidentally, was built in 1865 by Daniel Craig—no, not the actor, but rather the founder of the Associated Press. The Sisters bought the property in 1874 and built the existing building in 1928. The home closed in 1975 and sat vacant for many years. Today, Villa Loretto is a condominium building—an upscale one, judging by the Jaguar F-Type and Maserati sedan I saw parked outside. Henry Ward Beecher (1813-1887) was a famous clergyman, orator, and abolitionist. In the years leading up to the Civil War, he raised substantial sums of money to purchase slaves and grant them their freedom. He also promoted God’s love, temperance, women’s suffrage, and Darwin’s Theory of Evolution. Somewhere along the way, he apparently became quite a ladies’ man, leading one prominent historian to write, “it was standard gossip that ‘Beecher preaches to seven or eight of his mistresses every Sunday evening.’” Be that as it may, ol’ Henry built this Peekskill mansion in 1875. It is now a private, multi-family residence. The parking area of Henry Ward Beecher’s mansion seemed like another good opportunity to photograph the mighty BMW. It was a beautiful day for top-down motoring. As I continued to drive eastward, heading for Hartford, Connecticut, I had to detour slightly to see this tiny passenger station in Yorktown Heights, NY. It was on the Putnam Railroad line, known as the “Old Put,” and was in operation from 1877 to 1958. In 1796, an elephant named “Betty” became the first such animal to step foot in the U.S. After being exhibited in New England for several years, “Old Bet” was sold to Hachaliah Bailey, who intended to use her on his farm in Somers, New York. He soon discovered that it was much more profitable to display his elephant to the curious public. Together with a horse, several pigs, and a trained dog, Bailey’s Circus was up and running. Through a rather circuitous route, it eventually came to be the famous Barnum & Bailey Greatest Show on Earth. Alas, Old Bet was shot and killed in 1816 by a disgruntled Maine farmer who disliked the idea that poor people would be bilked into paying money to see an elephant. Hachaliah returned to Somers and built the Elephant Hotel in her honor. It now serves as the town hall and home to the Somers Historical Society. Eventually Highway 202 crossed over into Connecticut, and I found myself in a downright unsavory neighborhood in Danbury. I was searching for the Octagon House built in 1852 by Daniel Starr. Four of the interior rooms are also octagonally shaped, and there is a central, circular staircase made of mahogany. The Octagon House narrowly avoided demolition in 1973 as part of urban renewal, and by 2012 the once-beautiful home was abandoned and a hangout for neighborhood squatters, drug dealers, and prostitutes. Last year, Newstimes reported that “The city’s plan to buy the landmark Octagon House and transform it into the new headquarters of its blight-fighting squad is as much an effort to save a neighborhood as it is an effort to save a historic building.” It is slated for renovation and use as the headquarters for the city’s Unfit Neighborhood Inspection Team. I wish them good luck. Remember Henry Ward Beecher? Well, his roommate at Amherst College was one Orson Squire Fowler, who went on to become the country’s most noted phrenologist (someone who studies the contours of the human head as a way of determining personality and other characteristics). When he wasn’t analyzing the heads of people like President James Garfield, abolitionist John Brown, and Mark Twain, Fowler was promoting the design and use of octagonal houses, which be believed used space more efficiently and made people happier. Let’s hear it for True Characters! Downtown Danbury has an impressive Railway Museum, but I only had time for a quick photo before heading to see what might be left of a hilltop castle. My search for the castle started at Tarrywile Park, named for the mansion built here in 1895 for Dr. William C. Wile and his family. The good doctor had volunteered for the Union Army when he was only 15 and had a distinguished record of service that included Gettysburg and Gen. William Tecumseh Sherman’s “March to the Sea” during the Civil War. Afterwards, he became a surgeon and publisher of the New England Medical Monthly Some of the advertisements in the journal were quite interesting, including Glyco-Heroin (adult dose, 1 dram; for children, from 5 to 10 minims) and Glyco-Thymoline (which is still sold today, although no longer recommended for “any part of the body”). Following directions from a friendly young couple in the park, I located and climbed the very steep former driveway to the castle. Hearthstone is still there, protected from vandals and roving photographers by a tall chain-link fence. By some accident, I ended up inside the fence, with Grave Peril facing both man and camera. It’s an impressive sight, with granite stone walls over a brick core. There were 16 rooms, along with 8 stone fireplaces. Oh, did I mention that Newton Curtis sold the house to Althea Thurber in 1931? Althea and her husband, James Thurber, used it as a weekend and summer house for a number of years. While Althea enjoyed her many dogs, James became a prominent author, poet, playwright, and cartoonist—despite having very limited vision as a result of a childhood accident. The New Yorker published many of his cartoons and articles, but James remains best known for his short story The Secret Life of Walter Mitty. Or Osbornedale, the home of Frances Osborne Kellogg who was a noted businesswoman, philanthropist, and advocate of women’s rights—perhaps because she lived so near a corset factory? Frances lived her entire life in this house, having been born here in 1876 and dying here in 1956. During her career, she served in many leadership positions, including president of the Union Fabric Company. It took a little more effort to reach the waterfalls—but the minimal available light made it easy to get “flowing” photos. In the 1800s, the steeply falling brook provided power for many mills and other businesses. From the park, it was time to pilot the 335i along the remaining 42 miles to East Hartford and a welcoming Holiday Inn for the night. Everyone knows that America’s greatest writer, Samuel Clemens—better known as Mark Twain—grew up in Hannibal, Missouri. But far fewer realize that he lived in Connecticut for much of his life. In 1873, he and his wife Olivia built their dream house in Hartford. They lived here with their three daughters, Susy, Clara, and Jean, from 1874 to 1891, and it was the happiest period of their lives. Most experts would agree with National Geographic that the Mark Twain House is “one of the ten best historic homes in the world.” I took this picture of the west side of the house while standing in what used to be the Park River. Twain used to love to look out the window and see the river, as it reminded him of his days on the Mississippi. Here are a couple of photos of the interior (courtesy of ”The Loveliest Home That Ever Was” by Steve Courtney), but also check out the excellent Virtual Tour at the Mark Twain House website. This is the library, with the conservatory at the far end. The latter was generally a bit overgrown, and Susy Clemens called it her jungle, where she and her sisters would happily play with their father. Twain bought an ornate, carved bedstead in Venice. He admired it so much that he always took visitors upstairs to his bedroom to show it off—and he slept in the bed backwards, so that he would see the larger head of the bed when he woke up each morning. See the thin piping that curves from the ceiling down to the angel cornerpost of the bed? That was a gas line, so that he could have a bedside reading light. And this is the billiard room and study, where so much of his writing was done. Here, Mark Twain wrote his greatest novels, including The Adventures of Tom Sawyer and The Adventures of Huckleberry Finn. Unfortunately, the story of the Mark Twain House does not have a happy ending. A disastrous investment in a good idea—automated typesetting—led to financial ruin for the Clemens family, and they closed up the house and moved to Europe in 1891. The eldest daughter, Susy, returned to the house in 1894 but contracted spinal meningitis and died before her parents could return. She was only 24, and Mark Twain’s grief was such that he never looked at the house again. Remember Henry Ward Beecher? His sister Harriet Beecher Stowe (1811-1896) wrote more than 30 books, including the highly influential Uncle Tom’s Cabin, which was a vivid portrayal of the many horrors and injustices of slavery in the U.S. Its publication in 1851 greatly advanced the abolitionist cause and is widely considered to have been a significant factor leading to the Civil War and the end of slavery. However, the book has also been criticized in more recent decades for its sometimes condescending and stereotypical characterization of African Americans. I knew that Harriet Beecher Stowe had lived next door to Samuel Clemens in Hartford, and at first I thought this Queen Anne must have been her house. I was wrong, however: it was built for Franklin Chamberlain in 1884 as a rival to the Mark Twain House. In 1940, Harriet’s grandniece, Katharine Seymour Day purchased it. Harriet’s house was this one, which is now the Harriet Beecher Stowe Center. She moved here in 1873 after having lived in Cincinnati, Ohio, Brunswick, Maine, and elsewhere in Connecticut. She was an active participant in the Underground Railroad in both Ohio and Maine, helping runaway slaves escape to Canada. Silas Deane: Revolutionary War Hero or Villain? The Silas Deane House is open to the public as part of the Webb-Deane-Stevens Museum. Photographs are not permitted, but if they were the front parlor would look exactly like this. The painting on the far wall is of Silas Deane as a young man. The only other known portrait of Silas was passed down through the Deane family to my late uncle John. His son, my cousin David, now displays it proudly in his home (see portrait below). In 1774, Silas Deane was appointed to the first Continental Congress, where he served with distinction and became fast friends with Dr. Benjamin Franklin. During the first Congress, Silas proposed that the colonists seize Fort Ticonderoga in upper New York and transfer the fort’s 100 cannon to the outskirts of Boston, to defend against the British Army stationed there. His plan was successfully carried out jointly by Colonel Benedict Arnold and Ethan Allen with his Green Mountain Boys—without having to fire a single shot. The captured cannon were instrumental in enabling George Washington to drive the British out of Boston. While Silas was in Philadelphia at the Continental Congress, George Washington and his officers were traveling through Wethersfield on their way to Boston. At Silas’ request, his wife Elizabeth Saltonstall Deane welcomed Washington and his officers to their home for dinner and rest. The meal would have been cooked here in the kitchen. Silas was using his own financial resources for living expenses and travel—and side arrangements with patriotic privateers. With direction and support from Silas, Captain Lambert Wickes attacked and captured 4 British ships—in the English Channel! Later, at the helm of the Reprisal, Wickes captured or sank another 10 ships. At the start of 1778, Deane, Franklin, and Lee signed the critically important Treaty of Alliance with France, paving the way for increased support—including French troops and naval ships. However, not all was going smoothly with the secret mission. Silas’ wife passed away in 1777, and he learned of his fact only months later by reading a newspaper from the colonies. Then Arthur Lee had a falling out with Deane and Franklin and accused Deane of personally profiting from Congressional funds. Despite assurances by Franklin that the accusation was false, Silas was recalled to America by the Continental Congress in 1778 to face Lee’s charges. Then Congress refused to allow him to defend himself or to reimburse him for his personal expenditures in support of the army. After nearly 2 years of this treatment, Silas was disgusted and broke; he returned to Paris in 1780 to gather the information needed for his defense. The Deane house and all its furniture had to be sold to help pay his debts. On top of all that, the personal secretary to Deane and Franklin, Dr. Edward Bancroft, turned out years later to have been a British spy. Consequently, the British were well aware of what the Americans were up to in France. In 1781, with the revolution going badly, a dejected Silas Deane began to wonder whether reconciliation with Britain might be a good idea. He raised this question in private letters to several close friends—but Dr. Bancroft intercepted the letters and turned them over to the British. When they were published, Silas was immediately considered a traitor by many. He continued to live in Europe, not having the funds to return home. His health began to deteriorate, and, with financial help from his brother, in 1789 Silas finally boarded a ship for the U.S. While being attended by Dr. Bancroft, Silas died at age 58 just as the ship was due to sail. An intriguing unsolved mystery is whether the doctor/spy Bancroft was actually poisoning Silas. The evidence is mixed, but the hypothesis lives on. Arthur Lee’s accusations ruined Silas’ reputation for many years. In 1841, however, Congress recognized the injustice done to him during the Revolution and paid $37,000 to his granddaughter—about one third of the total Silas had spent from his own funds on behalf of the Army and Navy. A rigorous analysis by modern historians indicates that Silas acted in good faith and very effectively throughout his diplomatic mission to France. Without the munitions and other supplies obtained from France by Silas, George Washington’s army might have been defeated outright before the War of Independence ever had a chance. And the assistance of the French military, which Silas had worked so long to secure, was instrumental in the defeat of the British. I’ll concur with the verdict that Silas was a hero, since (i) he spent his existing fortune in support of the Continental Army, (ii) he clearly did not gain a new fortune of any sort, and (iii) he never would have fooled cagey old Ben Franklin. Besides, I have to support my third cousin (six times removed)! Continuing along Highway 6 in Connecticut, I discovered that the State Police had closed the road, due to either construction, an accident, or just general grumpiness. That necessitated a lengthy detour, which turned out just fine because it routed me right by the Nathan Hale Homestead. Nathan Hale was an American Patriot during the Revolutionary War, serving as a soldier and spy. He was asked by George Washington to go behind enemy lines and learn where the British invasion of New York City would take place. Posing as a Dutch schoolteacher, Hale was able to report on the British troop movements for several weeks. When the city fell and Washington’s forces retreated, however, Hale was captured by the British. Just before he was hanged on September 22, 1776, he spoke the famous words “I only regret that I have but one life to give for my country.” He was just 21. Nathan Hale is the State Hero of Connecticut. The Nathan Hale Homestead, incidentally, is said to be haunted—not by poor Nathan but by his father, two of his brothers, his sister-in-law, and a servant girl. Eventually I reached the historic mill city of Willimantic, which means “land of the swift running water” in the Algonquian language. Famous Willimantic residents included both the California “Freeway Killer” and a former Senator from Connecticut—not that I’m drawing any comparisons. I’ll leave such snarky comments to Mark Twain, who once said, “Suppose you were an idiot. And suppose you were a member of Congress. But I repeat myself.” This is the town hall from 1897. The Willimantic River drops 90 feet in the space of a mile here, making it a favorite location for many kinds of water-powered mills starting in the 1700s. In the early 1800s, the city became a major manufacturer of cloth and thread and was known as “Thread Town.” These buildings were part of the American Thread Company. The textile companies thrived throughout the 1800s and into the next century, but they began closing in the 1970s; American Thread was the last one when it went out of business in 1985. Did I mention the glorious weather? It brought out numerous motorcyclists, including the fellow riding this Harley Davidson, who also stopped to admire the view at the thread mill. Unfortunately, from 1970 to the early 2000s Willimantic had another nickname: Heroin Town. As chronicled in the Hartford Courant, the rate of heroin use (and related prostitution) dwarfed that of any other city in the state throughout this period. Following the Courant’s publicity, law enforcement was substantially stepped up, and Willimantic has achieved considerable progress in revitalization. There were many more places to see in Willimantic, but in my rush to get to Cape Cod I’d managed to cover only 39 miles since the Silas Deane House. I could have proceeded directly to Providence, RI and then directly to the Cape—but instead I turned south at Providence. It’s a sickness, I know… Anyway, I found the Six Principles Baptist Church near Wickford Harbor, just for my staunch Baptist friends Cathy and Kim. Built in 1703, it is believed to be the oldest surviving Baptist church building in the U.S. (and, by Wikipedia’s count, the 15th-oldest of any denomination). Just in case you were wondering, the Six Principles were: repentance, faith, baptism, laying on of hands, resurrection of the dead, and final judgment. The congregation began meeting in this area in 1665 and has continued right to the present (in a newer building next door). While we’re on the subject of churches, this is the Jamestown Friends (Quaker) Meeting House on Conanicut Island, in Narragansett Bay. The original 1710 meeting house was burned by the British Army in 1776; the current one dates from 1786 and is still used occasionally for services. It is unchanged from its original construction. While getting another photo, I couldn’t help noticing what looked like a windmill off in the distance. Although the Jamestown Windmill is said to be the only one ever used on Conanicut Island, I was sure that I’d caught a glimpse of the ruins of another one a few miles further on. After much researching back home, I managed to locate the former Lippincott Windmill (on the left in this Bing Maps satellite view), thus proving that, despite what everyone says, I’m not crazy. Continuing to meander away from my Cape Cod destination, I took this picture of the bay, Conanicut Island, and the faithful 335i from atop some old ruins. The old ruins were what was left of Battery Whiting, set up in 1901 as part of Fort Getty. The rooms below were used to hold ammunition. Up top, there were two 3-inch, rapid-fire M1903 guns. This was the smallest of the three batteries at Fort Getty, but it is now the most visible. The guns were mounted on fixed pedestals in the two lower sections of the parapet. Fort Getty served as part of the coastal defenses during World War I and as a prisoner-of-war camp during World War II. The area is now primarily an RV park. From the northern end of Fort Getty, you can look across the bay to Dutch Island. The Dutch West India Company established a settlement here in 1636 to trade with the Native Americans. English settlers later purchased the island from the Indians, and in 1825 the U.S. government acquired the southern end of the island to built a lighthouse. Fort Greble was established here shortly before the Civil War, and it continued in operation until the conclusion of World War II. If anyone has driven through the rabbit’s warren of little streets in Edgartown on Martha’s Vineyard, then you’ll have a good idea of what driving through the old part of Newport, RI is like. It’s a beautiful area, but good luck trying to find any specific place! Native Americans had lived and prospered on Aquidneck Island for at least 5,000 years before the first European settlers arrived. Dutch explorers described it as “een rodlich Eylande” (a red island), with the name eventually becoming Rhode Island. This island joined with the surrounding Providence Plantations to form the colony of Rhode Island in 1644. One of the first settlers on Aquidneck Island was an extraordinary woman named Anne Hutchinson. She had emigrated from her native England to gain religious freedom in America but soon discovered that the harsh, Old-Testament ways of Boston’s Puritans did not align with her own beliefs. For a number of years, she privately taught the Bible’s “Covenant of Grace” to her friends and neighbors, but in 1637 she was charged with contempt, sedition, and other acts against religious orthodoxy. She was found guilty and banished from the colony of Massachusetts. Anne led a group of her followers to Aquidneck, where they were welcomed by the Wampanoag Native Americans. A portion of the group settled in the southern part of the island that is now Newport. This contingent created one of the first secular democracies in America, with emphasis on the separation of church and state. Newport welcomed people of any religion, including Jews fleeing the Spanish Inquisition in 1658, and the settlement quickly became one of the most prosperous ports in the New World. Any historical tourist worth his or her salt could spend many days exploring Newport. My first stop was the Vernon House, the original portion of which dates back to the late 1600s. Despite its appearance as a cut-stone building, it is actually made entirely of wood, with the siding chiseled and sanded to imitate rusticated masonry. (It certainly fooled me!) The house was purchased in 1773 by a descendant of Anne Hutchinson named William Vernon. When the French forces arrived in Newport in 1780 to support the revolution, General Rochambeau established his headquarters here. The outbreak of the Revolutionary War was a disaster for Newport, which was soon captured by British forces. The curtailment of all trade caused great economic losses, and a 1778 attempt by the Continental Army and French Navy to retake Newport failed. The British abandoned the city a year later, however, and Colonial and French forces took over the port’s defensive facilities. Fort Adams grew out of one such facility in 1799, in response to the U.S. Congress’ call for improved coastal defenses. Its design and construction were attributable to Major Louis Tousard, a French military engineer who had lost an arm during the 1778 Battle of Rhode Island. (He was later instrumental in the creation of and curriculum for West Point.) Fort Adams was completely rebuilt during 1824-1857, becoming one of the largest three masonry forts in the U.S. It defended Narragansett Bay during the War of 1812, World War I, and World War II before being decommissioned. Today it is an impressive state park. Of course, the hundreds of artillery pieces are now aimed at modern pleasure craft, but no one seems to mind. Newport’s “Gilded Age” began in the mid-1800s, when wealthy shippers, steel magnates, railroad owners, and others began building “summer cottages” here. The Vanderbilt, Astor, and Widener families all summered in Newport, two U.S. Presidents had their “Summer White Houses” here, and a young couple named John F. Kennedy and Jacqueline Lee Bouvier were married in the city. Chateau-sur-Mer cottage was the first of the truly grand mansions in Newport, with construction finished in 1852. To celebrate its completion, owner William S. Wetmore threw a party for 10,000 of his closest friends, setting the stage for all Newport summer parties to follow. His son George P. Wetmore inherited the mansion 10 years later and went on to become the Governor of Rhode Island and a U.S. Senator. Many of Newport’s cottages are open to the public. Inside, Chateau-sur-Mer is a dark, ornate mansion, almost like a royal Bavarian hunting lodge. The library was built in Italy, disassembled, and rebuilt here. I’m not sure if the Marble Room is named for its floors or its statues. Everywhere I looked were grandiose rooms, furniture, wallpaper, and other furnishings. Okay, so the word “cottage” scarcely begins to describe the opulence of these mansions—but that’s what they were called. The grandest of them all is The Breakers, built for Cornelius Vanderbilt II in 1893-1895. It has 70 rooms and 62,482 square feet of living space. 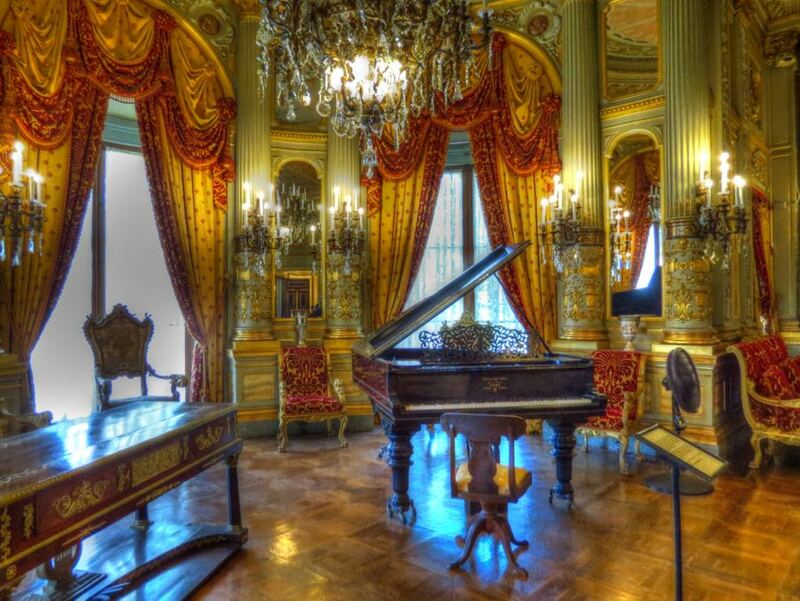 The Breakers and almost all of its furnishings were bought by the Preservation Society of Newport County in 1972, although Vanderbilt descendants continue to live on the third floor of the mansion. The interior is made of Italian marble. I could have spent an entire day touring this place—and pretending that it was mine. While many would say that these seaside cottages are nothing more than ostentatious displays of excess and self-indulgence, I’m glad that they exist. Occasional astonishment is not a bad thing! I eventually reached Cape Cod, completing my Official BMW Trip and joining my wife Nancy and several of our dear friends. However, I can’t resist including a few more photos from an outing to the Heritage Museums and Gardens at Sandwich, MA. The Heritage property was established by J.K. Lilly, III to honor his father and to house several of the family’s various collections. My favorite of these collections is the antique automobile gallery. I’ve been here several times, and this 1932 Auburn Boattail Speedster remains my favorite antique car, ever. If you look carefully, you can see the linkage that swivels the center driving light as the steering wheel is turned—just like the headlights on my 335i! Of course, actor Gary Cooper’s 1931 Duesenberg Model J Derham Tourster also remains a favorite. Only 8 of these cars were ever made, and this one is probably worth upwards of $4 million. The Heritage Museums also had a special exhibit of Hollywood costumes. This was the elegant gown worn by Emmy Rossum in her role as Christine in the Phantom of the Opera. Remember Kate Winslet as Sylvia Llewelyn Davies (Wendy) in the Peter Pan movie Finding Neverland? This is the nightdress that she wore in the early scenes. And it goes without saying that this is one of Captain Jack Sparrow’s uniforms from Pirates of the Caribbean, as worn by Johnny Depp. If you want to see the collection, go quickly—it closes at the end of October. I’ll end with this look at Martha’s Vineyard Sound, from East Falmouth, cantankerous tern and all. All things considered, this was a monumentally fun 2-day excursion. The 335i ran flawlessly, whether it was blasting along country roads or bumping across cobblestone streets, and I couldn’t have asked for a better automotive partner in adventure. To quote Mark Twain one last time, I was “as happy as a dog with two tails”! PS: Unless stated otherwise, historical photos are courtesy of the Library of Congress, the National Register of Historic Places, or Wikipedia.